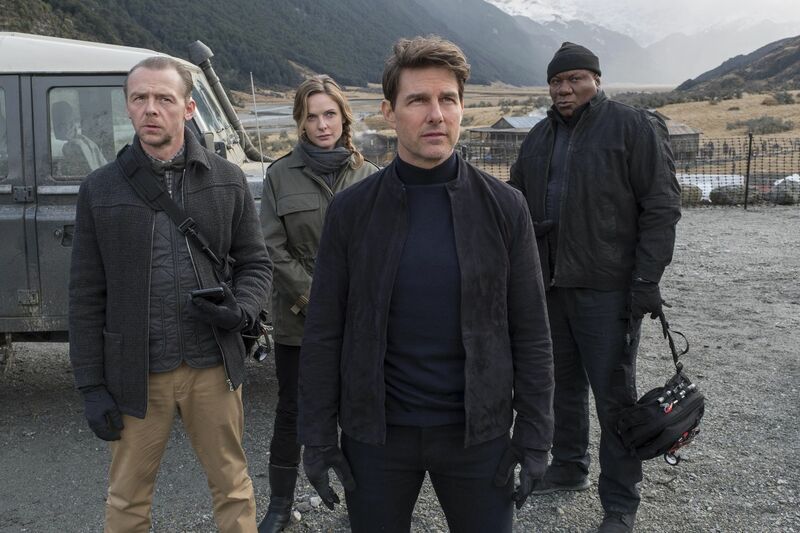 From left, Simon Pegg, Rebecca Ferguson, Tom Cruise and Ving Rhames in a scene from "Mission: Impossible – Fallout." Tom Cruise is our most earnest movie star – it's almost conceivable that he fractured his ankle on the set of Mission: Impossible – Fallout because somebody said, "Hey, Tom, break a leg." Well, it was for a good cause — he makes the movie fun to watch with his age-defying eagerness and death-defying stunts that bring a reasonably human scale back to blockbuster action, benumbed of late by the low-stakes digital fakery of special-effects movies. At 56, Cruise still runs like wind, even over Paris rooftops. It's as though someone's chasing him with the contract for a Mummy sequel. Cruise knows a good franchise when he's in one, and he's in one. This is his sixth Mission: Impossible caper, his second with Christopher McQuarrie, also the scripter for The Usual Suspects, and a guy who likes to pull the rug out from under his audience. Fallout is two-and-a-half hours, that's a lot of rugs. His plot doubles down on double-crosses, and of course there is the reliable Million: Impossible gimmick of the synthetic face impersonations, so we're never really sure who we're looking at. All part of the fun in Fallout, which finds Impossible Mission Force agent Ethan Hunt (Cruise) and his colleagues (Ving Rhames, Simon Pegg) trying to locate weapons-grade plutonium before it can fall into the hands of freelance terrorist weirdos with an apocalyptic agenda. Complications arise, and a mistrustful CIA (embodied by Angela Bassett) forces Ethan to work with a brawny government thug named Walker (Henry Cavill), who tags along to monitor the mission and keep an eye on Ethan. It's a fun change of pace for Superman Cavill, who wears a 1970s Greg Morris tribute mustache, and looms like Victor McLaglen in a John Ford movie. When Hunt and Walker confront a martial arts whiz in a Paris bathroom (one of several first-rate action bits), Walker actually puts up his dukes. He’s a caricature of throwback machismo, paired with the slick and modern Hunt. A funny sequence has them quarreling during a HALO jump into Paris. It’s such fun you don’t stop to wonder why they don’t just land at de Gaulle, like normal people. Their antagonistic chemistry is so good — Ethan as reluctant spy nanny to the mallet-fisted and blundering Walker — I hoped the movie would continue to place it front and center, but Fallout has 7,000 more characters to introduce. One is the White Widow (Elizabeth Kirby, vamping enthusiastically between episodes of The Crown), who's called the White Widow because McQuarrie likes alliteration. She's a broker in the plutonium deal, which turns out to be tied to the fate of Ethan's old nemesis Solomon Lane (Sean Harris), wearing a Hannibal Lecter straight jacket and taunting Ethan about his failure to protect Julia. Wait, who the heck is Julia? The dream-sequence prologue reminds us that she was Ethan's wife (Michelle Monaghan), last seen in Ghost Protocol being given a new identity and separated from Ethan for her own protection. So, you see, it's because he loves her so much that he pretends she doesn't exist, and engages in ongoing flirtation with Rebecca Ferguson, returning as leather-clad super-agent Ilsa. Like many of the stunts, this is something you should not try at home. Directed by Christopher McQuarrie. With Tom Cruise, Rebecca Ferguson, Ving Rhames, Simon Pegg, Henry Cavill and Michelle Monaghan. Distributed by Paramount Pictures. Running time: 2 hours, 27 mins.